Adventure Palace is a 5 reel, 9 payline video slot with an untamed jungle theme. This slot is full to the brim with Free Spins and contains the popular Gamble feature that allows gamblers to win some extra rewards. 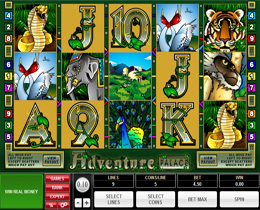 Adventure Palace slot has over 34 winning combination and contains a variety of winning icons such as the Scatter which is represented by the Jungle Palace icon and the Wild which is represented by the Elephant icon and is also the Jackpot icon. Should 5 of these appear on any active payline the player will win the Jackpot of 10,000 coins. Players will also win awards when icons such as the Tiger, Monkey, Peacock, Snake, Swans and the highly valued playing card icons appear. The Wild icon can show up anywhere on the reels and will become animated once they complete a winning combination. The realistic background sounds of the animals will be heard during winning combinations. The Free Spins feature will be triggered by the Scatter icon with an attractive 3x multiplier. This game is ideal for lovers of penny slots as the betting ranges from as little as 0.01 cent to as much as $1.00, and gives players the option to wager the maximum bet of up to $45 per spin.